Nothing beats dining out with good friends. Enjoying good company while feasting on mouth-watering dishes is simply the best! Top that with good, relaxing music coming out from randall amps at Guitar Center or similar gear and you are in for one enjoyable and unforgettable experience. Last March I had the chance to have a lunch date with my good friends from my former work. One of our dear friends, Mommy Mars, went home for a vacation from the UK and invited us to have lunch with her on Black Saturday. I tagged the little man along to see his godmother and my other friends. Good thing, one of my mommy friends, tagged her son, Jolo along, too. The two little men had a wonderful time bonding and playing! 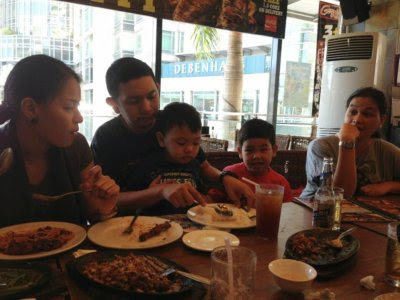 We had our lunch date at Gerry’s Grill at Greenbelt 5. I had pasta and chicken, thinking those where the only food on the menu that the little man is most likely to eat. Turned out, he was too excited to play with Jolo and did not give the food a second glance. In the end, I had to finish the food all by myself! 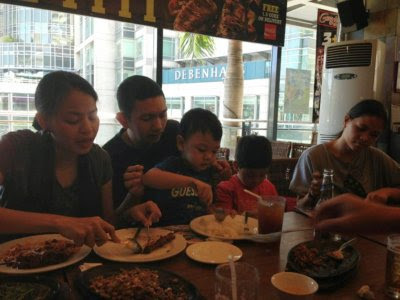 Also on our table are other delicious dishes, including the meaty sisig as well as an endless rounds of iced tea. But more than the hearty meal and the good food, it was the good conversation with familiar faces that I enjoyed the most. Also in attendance that day are Cil, my dear friend Ric, our former team leader, Jigs and Jannai, who tagged along her hubby, Wecky, as well. It was one fine dining and hanging experience. I hope to see these folks again real soon! This entry was posted in food musings and tagged dining out, eating on 22.April.2013 by admin.